Girl Kuripot Girl Kuripot: Electrolux Firande! Win P35K Travel GC! What's worth celebrating to you? For me, it's my life, love, blogging and travel opportunities! This is a chance to win a 3D2N Staycation at Makati Shangri-la Hotel plus P35000 Worth of PAL Travel GCs! This treat is brought to us by Electrolux as they celebrate their 10 fruitful years in the Philippines! Just share your pictures with The Little White Book App, answer what's worth celebrating to you and take a shot at this luxury and travel package. You can submit your entries until May 20, 2012. 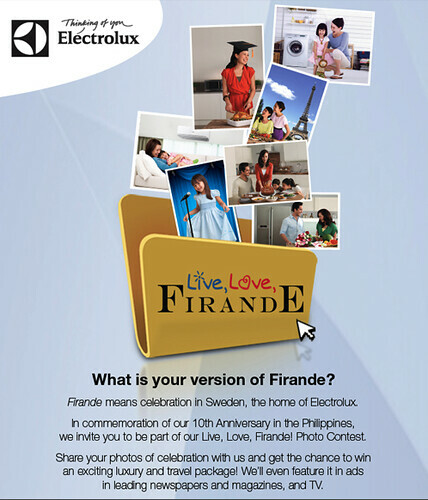 Click here to know more about the Live, Love Firande! Electrolux Photo Contest. Want a TV Phone? Join the Current Girl Kuripot Giveaway! 5 DTC Mobile Spark TV Phones up for grabs!